The ATP Site, Paterson, New Jersey at low water, 1903. Area around the Paterson Great Falls is designated to be a National Park! The Great Falls / S.U.M. National Historic Landmark district is a 118-acre industrial historic site located in Paterson, New Jersey. Located just 12 miles west of New York City, it is home to the largest and best example of early manufacturing mills in the United States. It contains 18th, 19th, and 20th-century waterpower remnants, including a three-tiered water raceway system. At the district's core is the natural landmark Great Falls, the second largest waterfall by volume east of the Mississippi. The 77-foot tall falls, engineered raceways and mills form a complex that is unique and irreplaceable to our nation. It has been described as America's very first systematic attempt to develop extensive waterpower for manufacturing purposes. 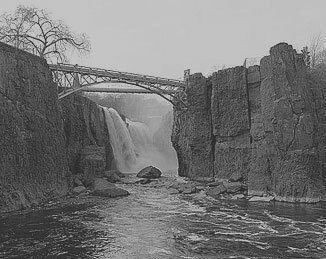 In 1791, Alexander Hamilton and a group of investors created the S.U.M., the Society for Establishing Useful Manufactures, to harness the tremendous power of the Passaic Great Falls. They hired Pierre Charles L'Enfant to design the largest, most significant power system at that time, one that diverted water from the Passaic River above the falls to mills along its route. It was the boldest private enterprise ever conceived in the early days of the United States. Hamilton envisioned an industrialized America and the creation of this raceway system was his ambitious example of how corporations could be organized to develop manufacturing on a large scale. With this enterprise, along with the law, finance and incentives he put in place as the nation's first Secretary of the Treasurer, Hamilton forged the basis of American capitalism. The planned industrialization of this historic place is the realization of the Hamiltonian vision of an industrialized America. This is truly a founding father's site. 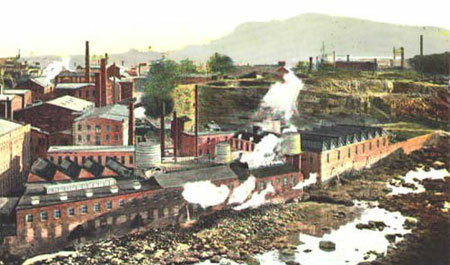 The City of Paterson, along with other manufacturing centers across New England, eventually created great wealth from the combination of waterpower, machines, labor, and capital. Paterson achieved prominence in the national economy undreamed of by its founder. The waterpower system fostered many technological advances in industry, such as the first cotton duck cloth for sails, the first continuous sheet paper, the first revolver by Samuel Colt, and the first practical submarine by John Holland. Paterson became the world's center for the production of cotton, silk and locomotives. This great industrial center attracted skilled artisans from all over Europe and the tremendous economic activity that arose here triggered the "Silk Strike" of 1913, when the skilled workers demanded an eight-hour day. This was truly an important emergence of America's industrial prosperity and the labor rights movement. The historic district has been listed as a National Historic Place since 1970 when the late Mary Ellen Kramer led efforts to block a riverside highway that would have cut through the mill district near the falls. This led to the designation of this district as a national historic landmark by President Gerald Ford in 1976. In 2001, a bill in Congress authorized the Secretary of the Interior to study the suitability and feasibility of designating the historic district as a unit of the National Park System. The entire NJ Congressional Delegation sent the Secretary a very strong letter of appeal in behalf of a positive determination. 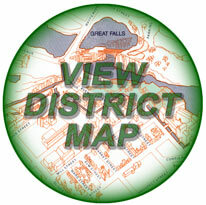 On October 21, 2004, Governor James E. McGreevey, along with DEP Commissioner Bradley M. Campbell, came to the Great Falls and officially announced the designation of the Great Falls historic district as one of three new state parks! "Today is an important day in which we celebrate not only God's natural beauty, but the people of Paterson, the ones who worked in these mills and who walked these streets," McGreevey said. A national competition will be held for the park’s new design, focusing on ecological aesthetics of the Great Falls, the city's Native American heritage and industrial history. Many great people, organizations and governmental agencies have worked over the years to enhance the historic district and protect it from neglect, demolition and incompatible development. A number of mills have been artfully restored, including one of the former Rogers Locomotive mills, which is now the Paterson Museum. The museum exhibits representations from Paterson's early industrial past and serves as a community center promoting the fine arts. Across the street, another Rogers mill building has been handsomely converted into the Frank R. Lautenberg Transportation Opportunity Center. Many other mill buildings are still being used for manufacturing purposes or have been converted into offices and housing. Federal and state funding have been used for “historic and public site” projects throughout the district. Areas along the raceways feature scenic walkways. Bridges have been restored. Unwanted tree growth has been removed. A total restoration of the Upper Raceway is currently being performed. Of great concern is the A.T.P. Site, which has fallen into abandoned ruins. It is at the heart of the district, directly adjacent to the Great Falls and situated along a beautiful stretch of the Passaic River. The city and past developers have allowed the mill buildings on this 7-acre site to be ravaged by fires over the past two decades. The National Park Service is now administering $1.67 Million in Urban History Initiative funding for archeological studies, site stabilization, and environmental remediation on the A.T.P. Site. However, these improvements were held up for several years by the City of Paterson's decision to also enter into an agreement with a developer to construct prefabricated townhouses on the entire ATP Site. This deal was viewed by concerned citizens and organizations as detrimental to the historic district's future. It would have required approximately 4-acres of parking lots and roadways that would have totally consumed this historic site with incompatible structures. The townhouses would have surrounded the Colt Gun Mill and occupied the entire length of the riverbank on the site. It would have destroyed historic structures, filled in raceways, obstructed views, and altered the waterpower terrain dramatically. These acts would have seriously and irreversibly compromised the potential to convey the historic significance of the raceway system on the ATP site and diminished the opportunity to transform this district into a cohesive heritage tourism destination. Unquestionably, the A.T.P. Site will be critical to the district’s heritage tourism appeal and state park designation. Its mill buildings and waterpower remnants are centered amidst a natural wonder with high cliffs, contrasting the natural beauty with early American mill industry. We hope you will be encouraged to join the community in the planning and visioning process that would steer the integration of the A.T.P. Site and the rest of the Passaic Riverfront into a design worthy of the district's historic significance, while enhancing public access in this beautiful natural environment. "Hamilton saw a future for America with a strong manufacturing capability of its own. The Society for Useful Manufacturers is a physical manifestation of Hamilton's vision of a more self sufficient America with a manufacturing base of its own. The ATP site is a remarkable opportunity for the City of Paterson. I believe the City of Paterson needs a vision of the future of the ATP site commensurate with the scale of Hamilton's vision." BANDWIDTH PROVIDED BY NET ACCESS CORP.